The format of Flipped Off is familiar and so is its star, memorable Survivor villain Russell Hantz. Flipped Off is a lot like other home improvement programs of the past two decades. Brothers Russell and Shawn Hantz, along with real estate agent Kristen Bredehoeft, work together to purchase, renovate, and flip houses in greater Houston. Each episode follows a single house from purchase to resale, revealing the strategies and some surprises that make up the process. Even as that format sounds familiar, the show offers the prefab celebrity of Russell Hantz. He competed three times in the space of four seasons of Survivor, and developed a reputation as a hard worker who aggravated his fellow contestants with his constant self-aggrandizing and devious manipulating. As a result, many fans consider him one of the show's all-time greatest villains, a man the audience loves to hate. This might seem to make Hantz a curious choice to star in his own series. 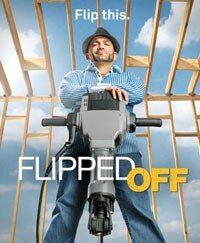 It's tough to imagine that the majority of the built-in audience for Flipped Off would want to watch him for a full hour each week, except maybe to hope he fails in his house-flipping endeavors. Schadenfreude doesn't seem a strong enough reason to keep people watching from more than a week or two. So it falls to Russell and the show's producers to find a balance that will display the aggressive personality for which he is known, but also make him likable enough so someone can root for him. The first episode has a lot of the former, but not much of the latter. It opens with Russell, Shawn, and Kristen looking over a modest, three-bedroom, two-bathroom house, and purchasing it for $225,000. The house is located in a swanky neighborhood, and Russell and Shawn think they can put in $46,000 worth of renovations, then flip it for well over $300,000. Trouble begins when Shawn wants to save $1,500 by skipping the homeowner's inspection. He declares he can do a fine job inspecting the house on his own, and proceeds to wander about the house, checking walls, pipes, and the roof. He deems it fine, and despite reservations expressed by Russell and Kristen, they make the purchase. The show sets a four-week limit for the renovations. Soon enough, the Hantzes are running into major problems with the plumbing, problems that run into the thousands of dollars. They also run into complications concerning stolen lumber, and begin to argue over the style of the renovation. Still, as you'd expect, the result is basically positive for the Flipped Off team. This "basically positive" verdict applies to the production as well. Flipped Off features appealing shots of Houston, and decently composed images help viewers follow along as the crew tears out walls, repaints the exterior, and adds a large deck to the backyard. Most usefully, shows the renovations in process, instead of having Russell or Shawn explain them in talking-head segments. On the other hand, the slick production values often call the veracity of events into question. When Russell and Shawn call the police to report the stolen lumber, Russell becomes belligerent with the officer for no fathomable reason. He ends up handcuffed in the back of the police car, leaving Shawn to explain to the officer that Russell's been under "a lot of stress" because his marriage is falling apart. Predictably, the policeman doesn't make an arrest, but we're left wondering whether the incident has been staged, as we do regarding another bit, when the Hantzes discover a large dead rat in a toilet. Though the Hantzes guess the rat must have crawled through a large hole in the pipes to get to the toilet, it looks more like a well-fed dead lab rat than a wild one. Sometimes the guys are also hard to believe. At one point Shawn tells Russell to take some time off and work on his marriage, and Russell leaves the project for a week. But on camera, Russell isn't inclined to "work on" anything, complaining that his wife thinks he's "changed" since he became a celebrity -- which can't possibly be true, right? He also orders Shawn around, forcing him to do unpleasant tasks, as if he's Russell's employee. Shawn states several times that they are 50/50 partners in the endeavor, and in the end neither of them seems convincing. If his wife thinks he's different, for those of us who watched Russell on Survivor, his attitude is far too recognizable. Though I liked his assertiveness then, it's not so welcome outside the game show context. This means that Shawn and Kristen are left to soften Russell's hard edges, a dynamic the show hasn't worked out yet. Shawn is perfectly willing to go toe to toe with his brother, but most of the decisions he makes in the course of the episode backfire. Kristen doesn’t appear to have a place yet, except at the beginning and end of the episode, during the purchase and sales segments. So far, Flipped Off seems unfinished, as if it's not ready for its own sales segment.